Solyndra was the pie in the face, but Keystone XL is the rake in the yard the White House needs to avoid. Approval of controversial pipeline is bad for the environment, and bad politics, as it would offend not just environmentalists, but voters of all stripes across America’s heartland who would have the pipeline run through their backyards. It is another ethics landmine that would invite more attack from the WH’s political enemies about pay to play politics– this time because of copious amounts of Big Oil influence-peddling. We’ve previously talked about Solyndra. It’s not a problem with solar or of federal investment, but of questions about campaign finance and due diligence, problems which also exist in the much larger loan program for nuclear, especially when nuclear energy companies have been such big campaign backers of Obama’s. In fact, worth reading is Brad Plummer’s Five Myths About Solyndra from the Washington Post, a great take from Climate Progress about the Solyndra timeline showing the and this post from Blue Virginia showing there’s plenty of blame to go across the partisan aisle for this mess. Money in politics will ALWAYS create these problems. You can see here how a wireless company was trying to trade on their big dollar donations to get access to the White House. This is why Obama must champion REAL campaign finance reform, specifically full disclosure of all independent expenditures and public financing options for people running for Congress. But that is a tough legislative mountain to climb– and not one that it seems the White House has the intestinal fortitude for, given their willingness to always “compromise” (read: capitulate) to the Powers That Be. But those Powers That Be don’t Be without the steady stream of money they pour into campaign coffers, so its unlikely that Obama would rush to reform that system that has, so far at least, worked out better for him than his opponents. So while it is unlikely Obama can avoid the ethical morass and swampland that is money for access and favors, one landmine he can avoid in approving the Keystone XL pipeline that would bring the world’s dirtiest oil from Canada to Texas. 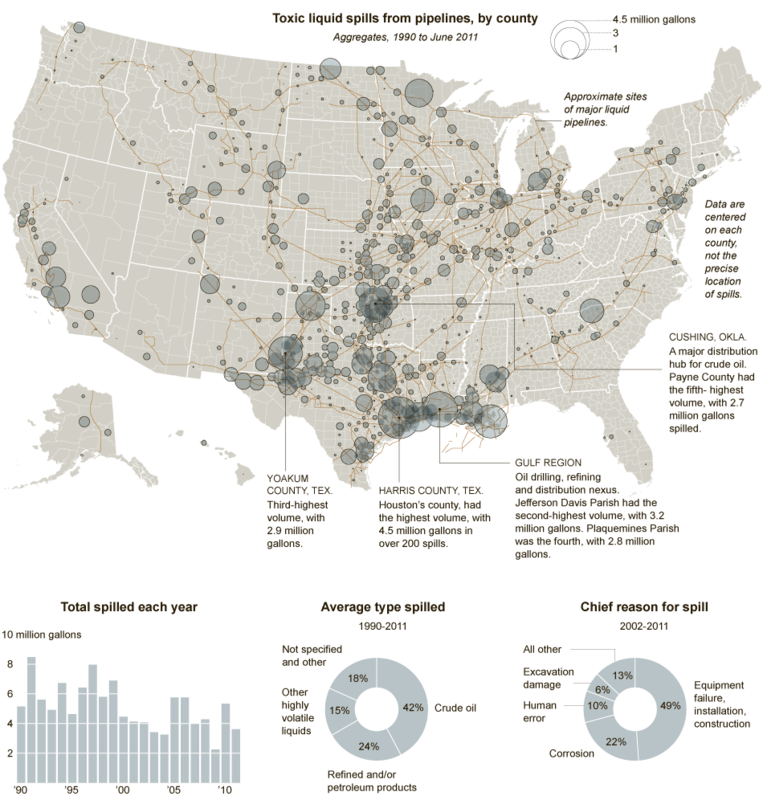 Not only should we be seriously questioning the safety and integrity of our pipeline system after spills from as far afield as downtown Salt Lake City to Kalamazoo to Yellowstone National Park, but this graphic from the New York Times shows the large spills we’ve had all over the country just from existing pipelines. The other question is obviously one of addiction. If we are to take seriously the metaphor of an addiction to oil, then Keystone XL is like a new meth dealer moving in next to our heroin dealer. Climate scientist Jim Hansen has called the approval of the pipeline “game over” for the climate. But besides a discussion of the merits, there is the question of why is this the rake in the yard Obama needs to avoid? It starts with the voters, specifically those who will be affected by this pipeline. East Texas cattle rancher Don Williams has trimmed his herd in half, lost calves to drought, and now faces wildfires burning just 20 miles from his ranch. Even before all of this, Williams was concerned about the impact the proposed Keystone XL tar sands pipeline would have on water supplies in the Carrizo Wilcox aquifer, which most East Texans rely on. When he learned that the State Department, in their review of the proposed pipeline, had not even looked at what drought conditions meant for the pipeline’s safety, he was outraged. that the historic Texas drought, which has been devastating communities and grabbing headlines all summer long, was overlooked by the US State Department in its third and purportedly final environmental impact statement (FEIS) on the controversial Keystone XL tar sands pipeline. The report issued by STOP examines the implications for operating the proposed pipeline, which would push the denser and more toxic tar sands oil at higher pressures and temperatures than conventional oil pipelines, during droughts like the one currently scorching Texas. According to STOP, the impacts of a severe drought were ignored by the U.S. State Department in its review of the environmental impacts of the proposal. STOP also documents that the Texas Commission on Environmental Quality has placed six TransCanada water withdrawal permit applications on hold due to drought. To make matters worse, says David Daniel, the oil being delivered by this pipeline may not be intended for U.S. consumption. He points to a report by oil industry economist Philip K. Verleger, which concludes that the tar sands oil is much more likely to be exported to global markets for consumption in China and Europe. You should visit their website at stoptarsands.org to listen to the rest of their stories. Their full study on the drought vs. the pipeline can be found here. Beyond that, with lobbyist ties to the White House, this makes approving the decision for the Keystone XL the biggest affirmation that pay-to-play politics and revolving door between industry and government are alive and well in Washington DC. TransCanada, the owner of the proposed pipeline, hired former Clinton campaign staffer Paul Elliot and several other Obama staffers to lobby the State Department and the White House. Is it any wonder why their analysis would overlook something so obvious as the Texas drought when they are being lobbied to get this out the door as quickly as possible? It’s worth noting this is the third flawed FEIS that the State Department has produced. Three strikes and you’re out? Well, if there was any justice in this world, yes, as it would be obvious this is not due diligence, but pure politics and a Potemkin village of looking at impacts to local residents and their water supplies. It is a boneheaded mistake, and makes it look like the Obama administration is full of a bunch of rookies, making obvious mistakes like forgetting drought. 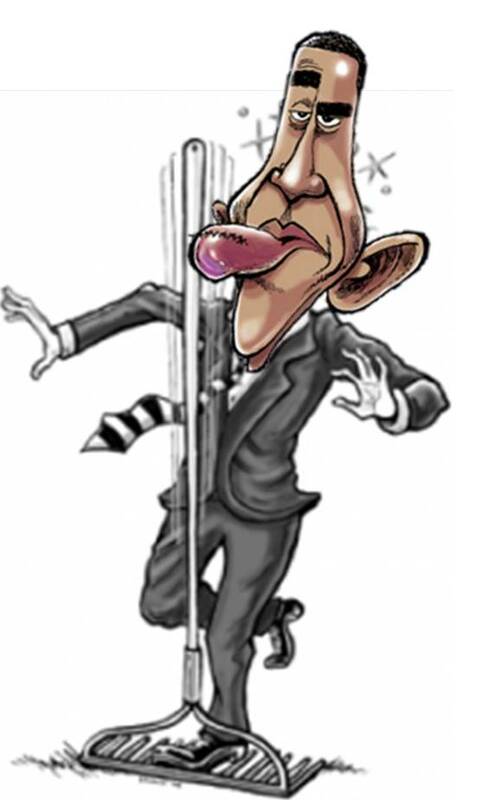 If Obama wants to avoid having his Presidency resemble The Three Stooges any more, he needs to clean the pie off his face from Solyndra, and don’t even go close to that rake. He can’t afford another similar self-inflicted wound, especially one that is not only so avoidable but also happens to be the right thing to do. Now where are those three nincompoop chandelier hangers I hired?